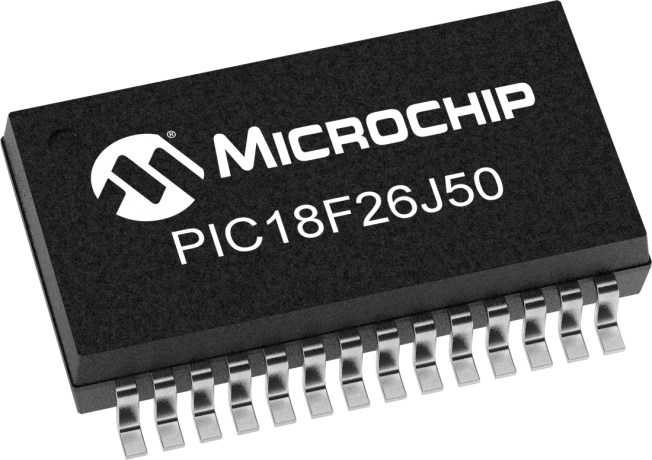 This low power and high performance 8-bit MCU with integrated full-speed USB 2.0 and peripheral flexibility comes in a small package for cost sensitive applications in the PIC18 J-series. New features include Deep sleep mode for low power applications, Peripheral Pin Select for design flexibility for mapping peripherals to I/O pins and a CTMU module for easy capacitive touch user interfaces. The PIC18F46J50 family is ideal for applications requiring cost-effective, low-power USB solutions with a robust peripheral set in a small package. The PIC18F46J50 FS USB Demo Board (MA180024) is a USB 2.0 full speed and low speed demonstration and development board featuring the PIC18F46J50. This is recommended as an initial USB development platform for applications that will be using any of the PIC18F46J50 family microcontrollers including the PIC18F46J50, PIC18F45J50, PIC18F44J50, PIC18F26J50, PIC18F25J50 and PIC18F24J50.